StadsTuinderij Piushaven is an urban farm which is located really close to the city center of Tilburg, the Netherlands. The urban farm is run by groups of volunteers who farm various fruits, vegetables and spices under the supervision of professionals. As well as this, the farm houses bees, pigs, chickens and Scottish Highlanders. The urban farm invites people to come and join in as a volunteer to get your hands a bit dirty or to their local shop, where they sell the produce. The urban farm is located very close to the city center and therefore is a really cool alternative kind of land use form. The city center is made up of densely stacked infrastructure, therefore the urban garden is a nice characteristic to have to mix up the land uses functions. The city center has many usages, but can now also be considered as a place to come and garden! Stimulating communal activity can be difficult, but this superbly tackled with this kind of a program. The urban farm stimulates volunteers to come and interact at the farm. People can participate by literally involving themselves with gardening or taking care of the animals, or they can just come by for a visit to simply enjoy the natural scene and the company of others. StadTuinderij Piushaven supports green initiatives. Supporting neighbourhood plans and experimentation if the implementations consider the environment too. 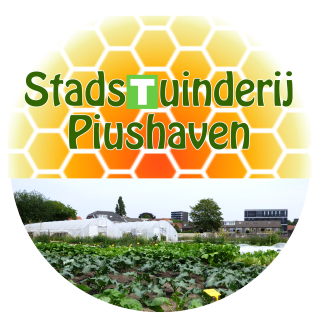 With this, StadTuinderij Piushaven involves themselves in the community of Tilburg and not only their own urban farm. The urban farm is a measure which has changed the infrastructural balance of the city center. The farm provides a new area of greenery, acting like a park but with more activity reoccurring on a normal basis (farming). The area therefore acts as a sort of hotspot where people come to enjoy their free time. As well as this, the urban farm often organizes events where they invite people to come and try their new produce or to take part in an activity, such as a cooking class. There is always something to do with the urban farm. There are many results of the urban farm, ranging from small scale impact to larger scale impacts. For example, a small scale impact can be that there is food being grown. The food being grown and produced has started up a small business for the urban garden as the urban garden has a small shop where they sell the produce. A larger scale result is that the urban garden has provided a better quality and amount of green to the city. As well as this, the urban farm produced an area where locals interact, more community interaction takes place. Another larger scale result is that a stimulation of more green and activity with greenery has been involved in the neighbourhood's surrounding the urban farm. This in effect has also raised awareness for inhabitants of Tilburg about the importance/ opportunity of greenery. Such implementation can be copy and pasted to anywhere. As long as there is an incentive for greenery, in cooperation with an active population about such implementation, then there is the possibility of such an urban farm. The opportunity of having such an urban farm does not come without an input. For such a farm to be successful there needs to be involvement of the population, because it is run solely by the volunteers. Volunteers must be prepared, as maintenance/ attention must be given to the farm all year round.